This Strictly Scrubs Unisex Scrub Set is style, quality and value, all bundled in one. No matter what industry you're in or the need for this set, this well-made medical uniform gives you the best value at a competitively lower price. This scrub set includes a same size classic V-neck scrub top and drawstring scrub pant made of a soft easy care 65% polyester 35% cotton fabric blend suitable for both men and women. The classic 1-pocket top has set in sleeves and a pen divided front pocket to make this top more functional for the on-the-go professional. Side slits and the V-neck cut have been fine tuned to fit you the best. 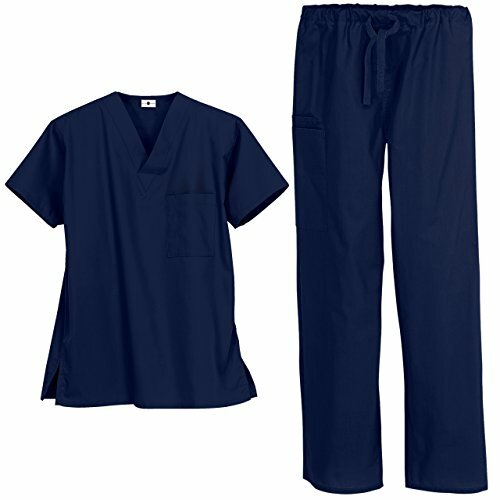 The scrub pant offer a roomy straight leg style and adjustable drawstring. For storage, there is a right side cargo pocket that features a secure interior cell phone pocket and an additional roomy back right pocket. To help complete the look, this set is available in 13 vibrant solid colors to coordinate with the season or match any standardized uniform requirement. For women who want a more fitted feel, we recommend you order this set one size smaller than your standard size. For men who want the best classic fit, we recommend you order your standard size. The approximate length for the medium scrub top is 29.5". The approximate inseam for the medium scrub pant is 31". Please refer to the additional product images that contain our size chart and measuring instructions to help determine your best fit. Since this set is sold only as a same size set, returns and exchanges can only be done as same size sets. CLASSIC FIT: This set is Unisex styled and fitted for durability and comfort ensuring these scrubs work as hard as you do without the hassle. The top features set-in sleeves, one left chest pocket for storage, and side slits for ease of movement. The adjustable drawstring pant provides you with three roomy pockets (1 back right, 2 right side) for all your accessories and essentials. For women who want a more fitted feel, we recommend you order this set one size smaller than your standard size. GREAT QUALITY: This set is made of a high quality blend of 65% polyester and 35% cotton that feel great and look good. These are made with healthcare professionals in mind. VIBRANT COLOR: This set is available in 13 vibrant solid colors to coordinate with the season, your style or match any standardized uniform requirement. EXCELLENT VALUE: This scrub set is exactly what the doctor ordered! Nurses, CNAs, Vets, Dental Assistants, Medical, Labs, Med Schools, Nursing Students, EMTs, etc. ; all find these affordably priced and available in a wide range of colors perfect for all healthcare professionals. Click 'Add to Cart' now to join the list of satisfied buyers! SIZING: The approximate length for the medium scrub top is 29.5". The approximate inseam for the medium scrub pant is 31". Please refer to the additional product images that contain our size chart and measuring instructions to help determine your best fit. | EASY TO CLEAN: Machine wash this scrub set in cold water with similar colors and tumble dry on low. If needed, cool iron. If you have any questions about this product by Strictly Scrubs, contact us by completing and submitting the form below. If you are looking for a specif part number, please include it with your message.